At the heart of the Irin Chronicles there is a beautiful love story. That fact is undeniable. But it's so much more than that, and I was reminded of this when I picked up The Singer. The time Hunter has taken to describe this rich world with such lush details is incredibly admirable. The story is spun in such a way that seems entirely plausible. I often made myself wondering if there might be whole worlds (possibly full of angels and half angels, etc.) hidden within our own, existing just beneath the surface. That is the power this story has. The agony you experience as a reader waiting for Ava and Malachi to be reunited is a mere shadow of the misery those two feel in the other's absence. I often found myself wanting to literally insert myself into the book and tell them what was going on, to end their agony. I raced through the pages simultaneously absorbing every delicious detail and anxious for Ava and Malachi's inevitable reunion. It does not disappoint. 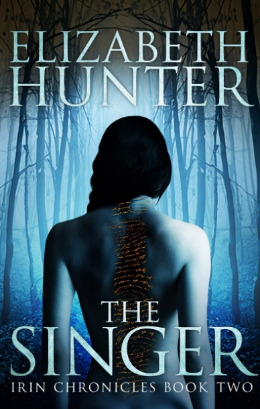 I am more than excited to see how Hunter will bring closure to this amazing series in The Secret. There are so many questions to be answered and so many mysteries to be solved. Luckily, we don't don't have to wait long. The Secret was originally scheduled to be released on March 31st, but Hunter surprised all of her readers earlier this week announcing an early release on March 19th, a whole twelve days before the original date. Owing to my fancy Advanced Release Copy, you can check out my review of The Secret here on my blog the day it comes out!